This walk: 2010-10-13. 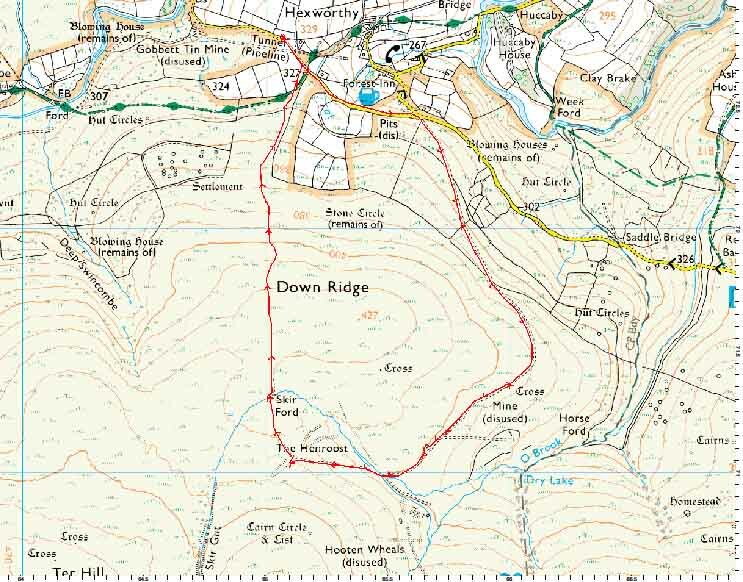 Hexworthy, cows, Yellow Brain Fungus, O Brook valley, gorse roots, Horse Ford Cross, Hexworthy mine buildings, wartime bullet holes, views of track, quartz, O Brook, bridges, leat, Hensroost gert, reservoir, Skir Ford Cross. Welcoming party at the gate. Yellow Brain fungus, Tremella_mesenterica, frequently found on dead gorse. View down the O Brook valley towards the Dart. Posing next to Horse Ford cross. Remains of buildings associated with the Hexworthy mines. Evidence of bullet holes. Apparently US troops used the buildings for target practise in WW2. Strollers disappearing along the track towards Hensroost mine (they don’t wait for Jim either!). Small bridge over an old leat. More substantial bridge over the O Brook at SX654 709. Water in the O Brook. Pointing out my camping spot of last year! Reservoir used for storing water; released when needed to generate power via waterwheels. There was a flat rod system between this area and Hooten Wheals (source – Follow the Leat by John Robbins). View to Skir Ford cross. This walk was from the Two Bridges-Dartmmet road, turning south for Hexworthy just before Dartmeet. The parking area is up the hill past the Forest Inn, turn sharp right,, park on the right, before thw cattle grid - where the map shows a bridle path crossing the road.